Goodyear Assurance TripleMax Tyres are on sale now! Prices start from $100 for 15" tyres. Prices listed are inclusive of installation, wheel balancing and replacement of new tubeless valve. The Goodyear Assurance TripleMax tire reduces braking distances by more than 2 meters on wet roads*, delivering Maximum Wet Grip, Maximum Control and Maximum Braking Ability. Reducing braking distances by more than 2 meters on wet roads*, the Goodyear Assurance TripleMax takes the worry out of driving. With consumer driven needs at the center of its tyre innovations, Goodyear has rolled out the Assurance TripleMax, the first tyre to boast Goodyear’s latest HYDROGRIP Technology® that delivers maximum grip for maximum assurance. Designed for mid-sized passenger vehicles, the new Goodyear Assurance TripleMax tyre was developed to provide drivers with increased peace of mind and shorter braking distances, particularly when driving in the rain. HYDROGRIP Technology® allows drivers to reduce braking distances by more than 2 meters on wet roads compared to other tyres in the market today*. 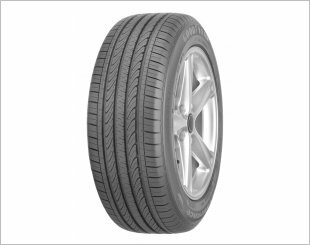 In addition to significantly increasing grip and shortening braking distances, the Goodyear Assurance TripleMax tyre was also developed with two other key consumer needs in mind; a high level of tyre durability and an increase in fuel savings. The Assurance TripleMax tyre is Goodyear’s response to deliver to consumers a tire they’ve always wanted – one which focuses on increasing grip to improve safety, while also extending tyre lifespan and maximising fuel savings. The all-new Assurance TripleMax tyres were developed with a distinctive wide face cavity for maximum control. In addition to improved safety, we develop tyres with fuel efficiency and resilience in mind. Reduces braking distances by more than 2 metres on wet roads. Reinforced with DuPont Kevlar for added protection. Saves up to S$530/318L over the life of the tyres. Tyres that gives you the feel of safe & sound. Quiet,comfortable on my latio 16" rim, dashed through the wet roads and it was great on the grip. Used fr almost 1.5 years . I am interested in the "Goodyear Assurance TripleMax 15" Tyre".